Water features add a sense of calmness and serenity like nothing else in the landscape. They are a quiet place to reflect on the day and a boon to wildlife - from bathing birds to garden-friendly frogs to all the dragonflies that will come for a drink. Always consider the plant life that will go with your water feature to make it blend seamlessly with the landscape. This could be in the form of lush plantings around it or species that actually live in the water - which do a lot of work to help keep the water clean. Populate the edges with reeds, sedges, and wetland wildflowers and plant floating lilies in the deeper water. In nature waterways are always curvy and sinuous, but when constructing one in the home landscape you don't always have to follow suit. This one is reminiscent of an ancient aqueduct, which is another wonderful inspiration for water features. As river rocks are always polished smooth by water, it makes sense that a water feature would be designed with a similar smoothness like this one. The setting for this three-tiered fountain is also evocative of the lush vegetation found along natural waterways, another small tip for landscaping around water features. 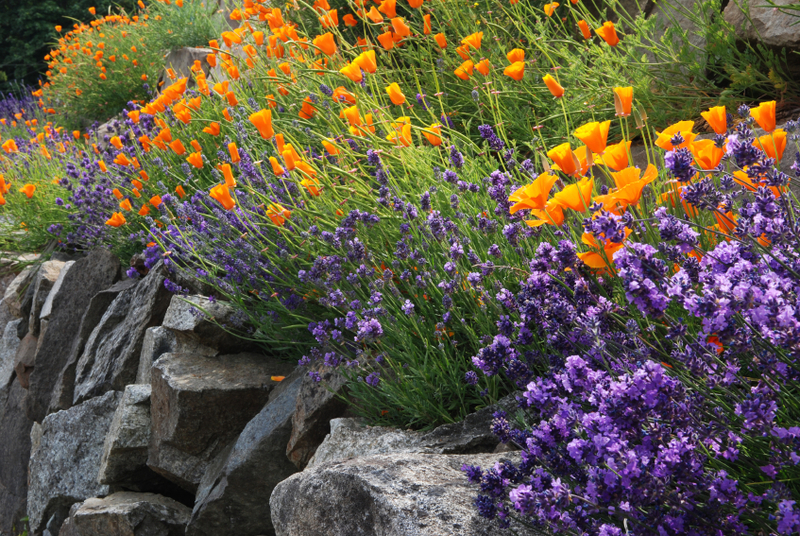 It doesn't take a lot of water to enjoy the soothing qualities it brings to the landscape. A tiny fountain pump that delivers barely more than a trickle can be just right, especially in small spaces where a rushing stream could overpower the stillness. Figuring out where the water goes in this picture may be a little difficult at first glance. It is certainly not just overflowing onto the ground causing a mess; rather, it is flowing into a concealed basin housing a pump under the rocks. This is a great technique for small spaces, often called a disappearing fountain. This is an unusual take on several formal fountain motifs. Lion heads are just one of many forms of statuary that can be found outfitted with a tube to pour water out of its mouth. The ornate urns, square basin, and marble mantle backdrop all add up to create a uniquely formal flair. Pick and choose from the ideas presented for a water feature that suits your own sense of quirkiness. Arid environments can have water features, too. In this case you don't have to follow suit and use lush vegetation. The succulents, boulders, gravel mulch, and terra cotta color scheme all blend well together in this example of a Southwestern-themed oasis. Though they may not be immediately apparent, there are several interesting elements worth considering for your water feature in this seemingly mundane example. Note the lights positioned over the small waterfall, as well as the lower pool, which will make a stunning nighttime transformation. There is also a stone carved out for planting on the left, which is a neat way to incorporate vegetation around a water feature. Finally, check out the old millstone - the round rock on the right with the hole in it - which is a fitting architectural relic to include in a water feature. Swimming pools can be much more than a two-dimensional feature in the landscape. Integrating ornamental water features with them adds a lot of ambiance to the poolside environment. Another example of statuary turned fountain, these sea horses are a great fit for a swimming pool with a marine theme. Good landscape design doesn't always imitate nature exactly - it often interprets natural forms in a stylized manner. Such is the case with this manmade waterfall cascading over a series of steps in homage of the stepped stones of a natural waterfall. Floral plantings follow suit as well. The stepped or terraced water feature theme can play out in many different ways. This one resembles a canal or aqueduct, but the idea could also be morphed into something resembling the terraced rice paddies of Southeast Asia. You can also create terraced benches underwater to accommodate the different types of aquatic plants that require different depths of water. Urns of all shapes, sizes, styles, and colors are easily converted to simple, elegant water features. This is another case of disappearing fountains, where the basins must be hidden under the rocks with a grate of some sort to rest on. In this case the small smooth multi-colored river stones are arranged in an abstract design resembling the movement of water. A lovely example of the simplest type of water feature of all is one without a pump. These can be treated like a birdbath; change the water every few days before mosquitoes have a chance to breed. Or, you can use mosquito dunks, an all-natural way to control mosquito larvae in a body of standing water. If you're lucky enough to have a natural body of water on your property, there are many ways to accessorize it - such as with an authentic, antique waterwheel. Statuary makes a free-flowing brook part of the landscape and existing ponds can be outfitted with fountains to help bring them to life. Even if you don't have a natural body of water to play with, consider installing your own water feature. Whether it's just a tiny tabletop fountain or an elaborate waterfall, it is one sure way to bring freshness and serenity into your life.